How people, firms, things are connected to each other, and how different ways in which they are connected have different implications. How the properties of systems as a whole emerge from the interactions of their component parts. These are systems in which the whole is more than the sum of the parts. Decision makers in economics. How we can understand many social and economic questions better if we relax the traditional assumption that decision makers attempt to find the ‘best’ decision. Instead, they appear to use simple rules of thumb to arrive at ‘fairly good’ decisions. These topics are of course related. They draw on work from a wide range of disciplines, such as biology, economics, psychology, maths and statistical physics. Here is an article in Nature on this general topic. 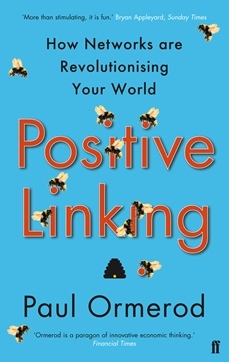 My latest book is: Positive Linking: How Networks and Incentives Can Revolutionise the World. The book explores the limits of conventional economics and why it needs to embrace the power of the networks – through ‘positive linking’. Read the preface and first two chapters here. I have also authored three other best-selling books. The Death of Economics, an attack on a particular form of economics, in 1994 and Butterfly Economics in 1998 have both been published in more than 10 languages. My third book, Why Most Things Fail, was named a US Business Book of the Year for 2006 by BusinessWeek magazine. I wrote the Death of Economics in 1993. But a lot of what I wrote then is relevant to the current crisis. Of course things have moved on, but here is the preface, chapter 1 and a chapter on the pitfalls of economic forecasting. I am a Fellow of the British Academy for the Social Sciences and in 2009 I was awarded an honorary Doctor of Science degree by the University of Durham for the ‘distinction of his contributions to the discipline of economics’. I am a Visiting Professor in the Centre for Decision Making at University College, London (UCL). I write a weekly opinion column every Wednesday on economics and related topics for City AM, a newspaper aimed at workers in Central London. A short book of some 50 of the pieces will be published later this year. I present regularly at a wide range of business and academic events.. I am involved in a high tech venture which applies advanced analytical techniques which turn the vast amount of information available in Big Data into actionable knowledge, for decision makers in both the public and private sectors.